Pulsar’s Helion XP50 2.5-20×42 Thermal Monocular is one of the best high-quality monocular that boasts an impressive list of features. When thermal monoculars became popular several years ago, I wasn’t immediately enamored with the new technology. Since that time, I’ve had a chance to use some of the latest thermal scopes in the field and have become a full-fledged convert to thermal imaging. Now, there’s rarely a day that passes that I don’t use a thermal device for something, whether scouting game, keeping tabs on thieving raccoons and rabbits in the garden, or simply scanning the perimeter of my property before heading to bed. One brand that I turn to most is Pulsar. 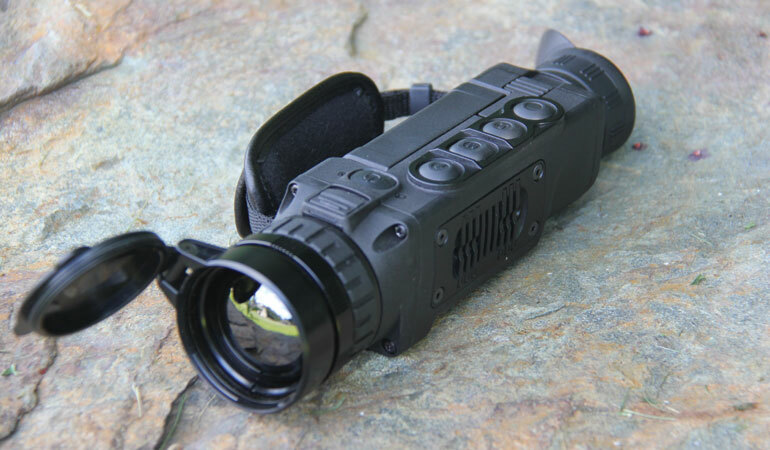 Pulsar has emerged as one of the leading names in thermal imaging technology and their Helion XP50 2.5-20x42 Thermal Monocular is one of the best high-quality monocular that boasts an impressive list of features. For starters, the unit comes with a 640x480 high-resolution sensor that provides incredibly clear images, detecting thermal energy at a range of up to 1,800 meters (almost 2,000 yards). The Helion boasts a refresh rate of 50Hz, that translates to clearer images of moving objects. It’s also relatively compact, measuring 9-inches long and 2½-inches wide. The Helion weighs just under 20 ounces and comes with a padded hand strap for easy carrying in the field even for extended periods of time. The Helion XP50 features a 42mm Germanium objective lens that can be removed and replaced easily. It comes with an ample focus wheel positioned just behind the objective lens. The rear eyepiece comes with a diopter adjustment wheel for fine-tuning the unit for the crispest, clearest image possible. The Helion XP50 is powered by an IPS5 lithium ion battery pack with an option to upgrade to the IPS10 battery pack. 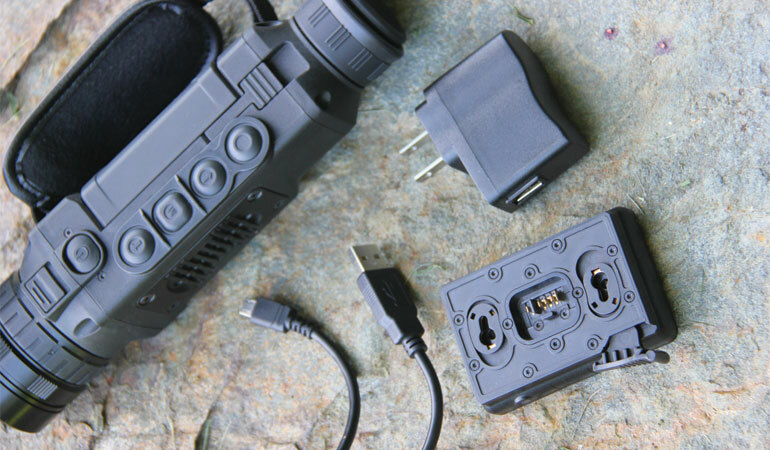 Powered by an IPS5 lithium ion battery pack, it can be removed from the unit for wall charging and there’s an option to upgrade to the IPS10 battery pack, if you need extended battery life. 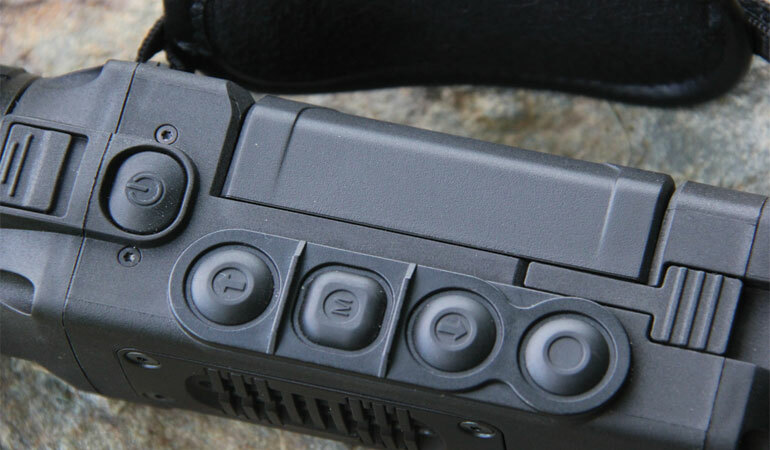 The battery is held in position by a secure latch system that prevents accidental release in the field. Operation of the unit is very simple utilizing a five-button layout that includes up and down controls, menu, power and record buttons. A micro USB port is included to allow the user to charge the unit without removing the battery or to download still and video images to a computer. There’s also a tripod mount on the bottom of the device for extended viewing sessions or when taking photos. To begin operating the Helion, attach the battery pack and hold the power button until the Pulsar logo appears on the screen and then make any focus adjustments necessary. Despite impressive high-tech features, the operation of the Helion XP50 is very simple. Despite impressive high-tech features, the Helion XP50 is quite intuitive to operate. Once the Helion is powered up, a short press of the power button calibrates the unit and a longer (but less than 3 seconds) press turns the display off to save battery life. Holding the power button for longer than 3 seconds, powers the unit down completely. Pressing the up button allows the user to instantly toggle between hot-black and hot-white palettes. When the unit is in color mode, pressing the up button switches the unit to hot white. Holding the up button also activates Wi-Fi settings which allows the unit to be paired with a cell phone or computer, transferring images to the device which allows for remote viewing. The down button acts as a zoom control and each press cycles the unit between 2.5X to 5X, 10X and 20X zoom settings and then returns to 2.5X. The down button also serves as the picture-in-picture (PIP) control and allows for PIP zoom. Holding down the record button for several seconds switches the record function from video to still imaging and a short press of the button either takes an image of the screen or begins video recording based on the chosen setting. There are two separate menu settings that allow the user to program the Helion. A short press of the menu button activates the hot menu, which allows the user to access zoom, brightness, contrast and range-finding controls. In range-finding mode, two stadia lines appear on the screen and can be adjusted up or down to measure the height of an animal. Pre-programmed range settings give accurate ranges for rabbit, hog and deer-sized objects, so you’ll instantly have an idea how far away the animal is even in complete darkness. A long hold of the menu button allows the user to access the main menu for changing Wi-Fi settings (including typing passwords), observation settings (forest, rocks or identification), calibration settings and color palettes. There are six different color options including red hot, sepia, red monochrome, rainbow, ultramarine and violet, as well as hot white and hot black settings for a total of eight separate color options. Despite this long list of customizable options, anyone who’s familiar with navigation screens on digital devices like cell phones, will have no problem navigating. An operator manual is included and a concise, simple-to-follow online video tutorial is also available from Pulsar. There was relatively little eye strain when looking through the Pulsar as compared to similar thermal imagers. I spent several hours testing the Helion XP50 on my farm under the cover of darkness. There’s little question that handheld thermal units provide a level of insight into wildlife movements that it is almost impossible to ascertain using white light or game cameras. Standing in the corner of a 10-acre soybean field I was able to observe seven deer as they fed on the crops during one late night. This group included a doe and her twin fawns that approached within 60 yards of my position. Near the end of the night’s sit, I saw a young whitetail buck emerge from the woods and feed on the border of the field, his velvet-covered antlers providing just enough of heat signature to be visible in the scope. All quality thermal scopes would have served in identifying warm-bodied deer but the advantage the Helion XP50 gives you is its incredible level of detail visible on cooler objects. I could identify single leaves on trees and the contour of the mowed path that I was following (a good thing since I didn’t bring along a white light and was relying on the Helion to navigate through almost complete darkness). Additionally, thermal imaging allows the user to view heat signatures even when the object is partially obscured by brush and objects. I identified a hot spot in a cluster of hickory and locust trees that turned out to be a doe moving slowly out into the open to feed. 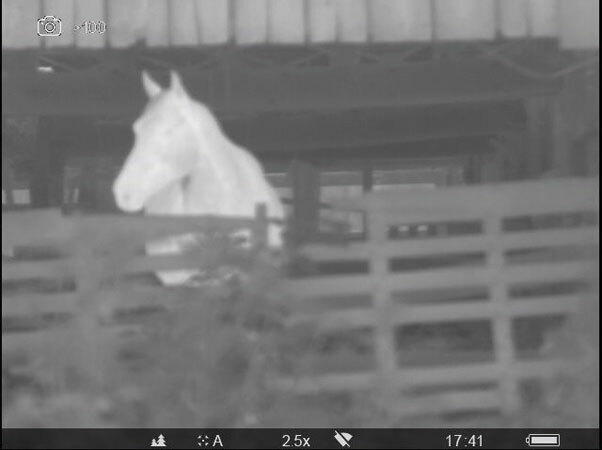 As with any thermal monocular, it’s important to take breaks to rest your eyes but there was relatively little eye strain when looking through the Pulsar as compared to similar thermal imagers. One full charge of the Helion’s IPS5 battery lasted a full four hours of viewing. Thermal imaging is certainly changing the way in which we see the world and the Pulsar Helion XP50 is a class-leading thermal monocular. At $4,400, it isn’t a cheap option but it’s worth noting that this type of technology cost tens of thousands of dollars to own just a decade ago. The field of thermal monoculars is growing but for now, the Helion XP50 is at the front of the class. For a look at Pulsar’s complete line of imaging monoculars and other products, go to pulsarnv.com.